Sigma announced the Sigma 35mm f/1.4 DG HSM Art during the 2012 Photokina. The lens is part of the company's "Art" series of lenses, ostensibly aimed at (and priced for) the pro-sumer market. The lens was designed to fit full-frame bodies, but can also be used on sub-frame (APS-C) cameras; the lens is available to fit Sigma SA, Canon EF, Nikon F, Sony A, Sony E and Pentax K mounts. On APS-C sensor bodies, the lens will produce an effective field of view of 56mm (Canon) or 52mm (Nikon, and others). The main feature of the lens is its constant and fast ƒ/1.4 aperture. The Sigma 35mm ƒ/1.4 DG HSM takes 67mm filters, ships with a petal-shaped lens hood and is available now for around $900. The Sigma 35mm ƒ/1.4 DG HSM produces surprisingly sharp results, even when used at its wider apertures, though it must be stopped down slightly for maximal sharpness. Mounted on the full-frame Canon 1Ds mkIII, the lens produces images with a sharp center but significantly soft corners when used wide open at ƒ/1.4. For isolating a subject this is actually quite good, but if you want corner to corner sharpness you will need to stop down significantly. Stopping down to just ƒ/2 everything gets a little sharper, but corner softness isn't really addressed; you have to stop down to ƒ/2.8 for that, where the corners are tamed enough that the lens is offering practically tack-sharp performance from corner to corner. This performance continues through to ƒ/8, and diffraction limiting begins to set in at ƒ/11, but you don't see the impact of this until ƒ/16, where a generalized softness begins to descend upon the image. Mounted on the subframe Canon 7D, performance for sharpness is very similar, perhaps a bit more forgiving at the ƒ/1.4 setting. The Sigma 35mm ƒ/1.4 DG HSM provides a very good level of resistance to chromatic aberration, and it's fairly constant across the range of apertures (if you see it, you'll see it in the corners in areas of high contrast). Even more noteworthy is a low amount of longitudinal chromatic aberration, which is typical of very fast lenses (ie., ƒ/1.4 or faster). This CA is evident in this lens, showing as magenta fringing on areas outside the plane of focus, but its not as prevalent as other fast glass we have tested. Corner shading isn't really a problem on the sub-frame Canon 7D, with the only noteworthy results being extreme corners that are 1/3EV darker than the center, when set to ƒ/1.4. At any other setting, light falloff is insignificant. On the full-frame 1Ds mkIII however, it's more significant: at ƒ/1.4 light falls off to make the extreme corners more than a full stop darker than the center; at ƒ/2, this falloff lowers to around 2/3EV. At ƒ/4 and smaller apertures, falloff results are a quarter-stop or less, which isn't really significant. 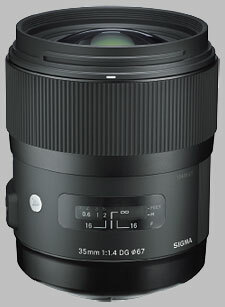 The Sigma 35mm ƒ/1.4 uses Sigma's HSM (Hypersonic Motor) focusing technology. While this system has historically produced fast and near-silent autofocus results, the implementation is a bit different on the 35mm, where it is slower than we'd expect, taking more than a second to focus between infinity and close-focus. The focus ring doesn't move during focusing, and autofocus results can be overridden at any time by simply turning the focus ring. The lens isn't designed as a macro lens, but provides 0.19x magnification when used at its minimum close-focusing distance of just under 12 inches (30cm). Sigma has moved in a new direction with its lens design. It has designed three categories within its new "Global Vision" of lenses - Sports, Art and Contemporary, and a new look is part of the package. The 35mm features a new finishing texture, doing away with the rubberized finish that had a tendency to break down over time and use. Instead the lens features a shiny black section of finishing near the lens mount, then a dull matte finish on the lens midsection. Half of this matte finished area is ridged, presumably for better handling. A shiny "A" is emblazoned on the side of the lens. 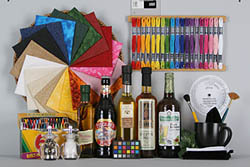 There are 13 elements in 11 groups in the lens, including SLD and FLD elements. The focus is an internal floating focus mechanism designed to give better optical performance at close distances. The aperture is composed of a 9-blade diaphragm and interestingly, these blades are not rounded. The lens was built in Japan. The build quality of the lens is good, and it has a very sturdy feel to it. The lens features a focusing ring and a switch to enable or disable autofocus, as well as a distance scale marked in feet and metres, protected under a plastic window. This distance scale features a single depth-of-field marker for the ƒ/16 aperture setting; there is no infrared index. The focusing ring is about an inch wide, composed of rubber with deep ribs. The ring is easy to turn but offers a solid level of resistance so accidental focus adjustments are minimized. The lens' focusing range ends in soft stops: an increase in resistance lets you know you can't focus any further in either direction. Focusing operations will not rotate any attached 67mm filters, making life that little bit easier for polarizer users. The lens is compatible with Sigma's new USB lens mount, which lets users apply firmware updates and make fine-tuned adjustments to lenses from their own computer. Unfortunately we didn't get a chance to play with the dock to see how these adjustments play out, but its very presence is a shot across the bow to the major manufacturers. The LH730-03 petal-shaped lens hood is around 2 inches in depth. The hood is a bayonet-mount that reverses onto the lens for easy storage. The interior of the hood is ribbed and works well to reduce generalized veiling flare. It's also worth noting the new design of the lens cap, which features a deep push-style mechanism for attaching and removing the cap. Despite being twice as expensive, we found the Sigma to be on an aperture-to-aperture basis a slightly sharper lens, with the Sigma 35mm producing tack-sharp results the Nikon 35mm could not. Chromatic aberration is also a bit lower: vignetting and distortion results are about the same. The Nikon is weather-sealed, where the Sigma is not. More expensive than the Sigma, the Sigma was able to produce images that were slightly sharper than the Canon, though some stopping down was required: at wide apertures, the Canon has intense corner softness. We haven't yet tested this expensive Carl Zeiss glass. The Pentax 21mm would produce a similar field of view as the Sigma 35mm; it produced almost as sharp results, with similar results for CA, distortion and corner shading. The Pentax is a much smaller and more portable lens. Sony's offering in this category proved to be sub-par, with very soft results wide open at ƒ/1.4. Sigma's produced an excellent lens in the 35mm ƒ/1.4 DG HSM, with comparatively great performance at the ƒ/1.4 aperture setting, where the lens will no doubt be used for the majority of the time. There's a lot to like here: great results for sharpness, low chromatic aberration, and low distortion. There is some significant corner shading when used wide open, but coupled with the corner softness at the same aperture settings this contributes to an interesting look and subject isolation. If you're looking for corner-to-corner image sharpness you'll need to stop down. The Sigma 35mm ƒ/1.4 is definitely priced to compete, and designed to perform. High overall IQ, great AF focus accuracy, very high build quality for a non-OEM lens. Corner falloff wide open, focuses in the opposite direction of Nikkor lenses and lack of weather sealing gasket on lens mount. This is the first f/1.4 lens for Nikon that I wouldn't hesitate using wide open, leaving little to be desired. With the possible exception of the 35/1.4 AFS G Nikkor, compared to other f/1.4 Nikkors optics in the 35/50 class, it is relatively free of coma and spherical aberration that hindered wide open performance of earlier lenses. Understandably, center sharpness is much better than corner sharpness but it's corners were much improved compared to earlier optics like the 35/1.4 AiS Nikkor. Stopping down to f/2, corner much improves falloff and by f/2.8 image sharpness is quite high over most of the frame. Unlike others who has AF issues with their samples, mine was fairly sharp right out of the box. Use of the Sigma USB Dock with a slight +5 compensation gave maximal sharpness at all distance settings. Since I use several AFS Nikkors and tele-extenders, the USB Dock eliminated the need of using one of the 12 memory settings on the camera's AF fine tuning. After photographing 5 years with the Canon 35 1.4L as a professional bide photographer from http://totaalfotografie.nl, I switched tot Sigma. My first three copy's had a very bad focus issue and even the fourth needed a focus correction of +18 on my three 5D Mark III's. After the calibration at Sigma the lens was perfect for the time being. Sharp, nice AF, smooth and amazing bokeh. But after shooting a while, this lens needed soms focus correction. I had to do it around 1 time a month. After the calibration the lens seems to be perfect again. I used Focal Reikan to calibrate (can't recommend this software of the crashes). After photographing a year with this nice lens I went back to my Canon 35 1.4L. En guess what, a better AF in terrible dark places and always sharp pictures in stead of the Sigma. The Sigma has some strange issues and as a professional who used both lenses en several copy's a long time I still recommend the Canon 35 1.4L. Maybe a little more CA beneath f2.2 but 99,9% of my pictures are sharp again. I have gone through several copies of this lens, first with my Nikon D600 (went through 6 copies), and now with my Sony A7 and the a Sony A Mount. All of the Sigma 35mm's I have tried have had AF accuracy issues, especially between the 2m to infinity focus region. I have the Sigma USB dock and it doesn't help much because the way the lens focuses near the 2m mark is very different from how it behaves near the infinity mark. The outer-most focus points on both the Nikon & Sony mounts back focus massively and this particular issue isn't fixable via the USB dock. I truly have a love/hate relationship with this lens and I would happily pay twice the cost of this lens just to have a solid working copy. Here is a post I have written about my issues with the lens. I recently ran into an issue with my beloved Canon 35mm 1.4 L lens. After many years of exceptional quality and loyal service, it started to back focus when photographing an object or subject from that was more than 3 meters away. I find the 35mm focal length to be essential for wedding photography.. especially when it is a prime and can capture subjects in dark situations and help them to pop with its wide aperture. In a pinch with a wedding in a couple days, I picked up the Sigma 35mm 1.4 DG HSM Art Lens from a local vendor. I have read really great reviews so I decided to give it a try. Price when purchased was $899 plus tax compared to the Canon 35 f/1.4L USM which is presently going for around $1,499 plus tax. I was instantly taken with the great, sleek look of the lens. I liked how it felt on my camera and to the touch. I can’t say I really missed the red ring that is synonymous with Canon’s professional “L” series lenses. The Sigma felt and looked like a really well made lens. With only a couple days until the wedding, I needed to take some pictures to make sure the automatic focus ( AF ) working and that there weren’t any other issues with sharpness, etc..
First thing I noticed is that the AF seemed a tad bit slower. Because I have used the Canon 35mm 1.4 so much, I really have gotten to know it. The AF is blazing fast.. probably one of if not the fast AF out of all the lenses I own. The Sigma wasn’t slow by any means, it just wasn’t quite as fast. Not a super big deal since it WAS fast, just not AS fast. Another thing I noticed was that the Sigma seemed to be a bit warmer. I didn’t mind this at all when working in post. I always felt the Canon was a bit cool (or more blue). However, to be honest, when shooting in dark situations with low light, I often liked the coolness of the Canon since it helped to balance out incandescent and ambient lights which can make the image look orange or yellowish. Lastly, it felt like the Sigma was a bit underexposed in a lot of the shots. I came to find out what that was about, but I will explain that more in detail down below. Great lens, very sharp wide open, nice build quality, feels like a quality lens. AF seems good, but haven't used it for fast action. Bokeh is very nice. Good lens cap and lens hood, better than Canon. Hood included in price. Not weather sealed is about the only negative aside from the fact this is a fairly heavy lens. Not a negative but something to be aware of. Highly recommended. I have Sigma 70mm 2.8 Macro which is the sharpest lens I owe (it is a perfect lens optically). Sigma 35mm 1.4 Art is as sharp or bit sharper in the center and slightly softer on the corners. I have 3 other sharp lenses (Nikon 135mm 2D DC , Nikon 85mm 1.8G and Nikon 50mm 1.8G) , but they are nowhere near these 2 Sigmas in sharpness. I compared all lenses at F5.6 in 3 occasions and results are consistent. None that I would really criticise apart perhaps from its size - but I dont really class that a failing, more of a "feature"
All the lies they tell about this lens are true. I have never before bought a Sigma lens believing that the best lenses tend to be the ones from the major manufacturers like Nikon and Canon. This is the lens that proves that to be wrong. Its is well built, handles well and is sharp from the get-go. At something not much over half the cost of the Nikon equivalent this is actually a slightly superior lens in terms of its image quality and not that far behind so far as I can see in terms of build. One other minor issue I would note. I have noticed that the satin finish on the plastic hood and lens cap seems to readily acquire rub marks. Something about the finish and the hardness (or rather softness) of the plastic. I have bought cheap aftermarket ones for use in the field thereby keeping my original ones more or less pristine in case I should ever sell. Again I don't know if I would class this as a problem or a "con" - just something of which to be aware if you are picky about keeping your gear in good condition over time. Sigma shows how to make topoptics with fair prizes! Despite the use of some plastic the Sigma 35mm f/1.4 DG feels sturdy and durable. It's somewhat big and heavy though. Because of the size and weight of the lens, I think it pairs nicely with a camera body like the Nikon D600, D700 or D800. On a lighter body it probably feels a little front heavy. The lens hood fits like a glove. I really like the black semi gloss minimalistic design. The zoom ring doesn't rotate super smooth, but it's good enough and it provides good grip. I don't really need a manual zoom ring on this lens, so I don't care. Autofocus is fast, silent and accurate. 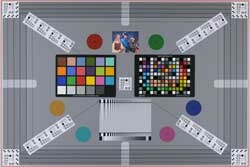 However there are reports of focus errors on some cameras. Specifically on the D800. I often only use the center focus point of my camera (D700 and D600), and that seems to work just fine. The optical quality of this Sigma 35mm is excellent. Wide open at f/1.4 the center is totally usable and it gets better if you stop down. At f/2.8 most of the frame is nice and crisp and peak performance is at f/4 - f/5.6. This is a super sharp lens. Contrast and colors are perfect. The out of focus area looks good to me. Some people say the bokeh is a little busy. It depends on the subject, the distance and the light I guess. I think this lens beats all the alternatives from Nikon and Canon and also the manual focus Samyang. Try one, you'll be smiling about the results. Although the image quality of this lens is excellent, it does have some issues with focussing on a Nikon D800. It seems to randomly front and back focus. I can’t find a pattern in this behaviour. Other lenses work fine on my camera. I’ve found more messages on the internet about this focus issue. It surely makes the lens less desirable. Hopefully Sigma finds a solution for this problem. This is the sharpest lens I have ever owned. It has no peer or close competitor in either quality or price. I have no regrets about getting it. This lens is a HUGE improvement from Sigme!!! Focus is fast, silent and very accurate. I've never experienced any back- or front-focusing problem. The focus ring is well-damped; manual-focusing felt great. However, the rubber easily cathches dust, but it's minor problem. Picture quality-wise, I found this lens to be very sharp corner-to-corner, with minimal fringing. Bokeh quality is great IMHO. Buid quality is top notch; felt more like a CZ lens. Regarding the weight, this lens is heavier compared to other 35 mm f1.4 lenses but it handles very well. All in all, a wonderful lens at a bargain price! A sharp lens wide open and an extremely sharp lens stopped down. Autofocus is fast and quite. Not weather sealed but that's of no importance to me. The build quality of this lens is very, very good with a Zeiss like feel to it. The focusing ring is large and quite smooth for an AF lens. The optics are quite astonishing and it's one of the sharpest lenses I've ever used and I have some good ones. It's looks great too, which can't hurt. Value for money it can't be beat. Sigma deserve all the accolades they get producing a lens of this quality at the price, in fact, even if it was double the price. Sharp already at 1.4 on my D800, great bokeh, great Body. I love this lens. Not sealed, but is not so important! I have the Sigma, because I like the Nikkor 35mm and is too expensive. The D800 works great with this lens. The high light intensity can be fully utilized, even at f/1.4 it produces sharp images. Each aperture, the sharper it becomes more. My sharpest lens far the Macro Nikkor VR was 105. The lens makes it easy to enjoy and has the great bokeh pictures.